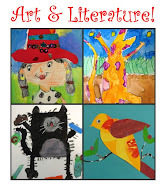 This is a lesson I usually do with my third graders, but it could suit almost any grade level. It's great to have a variety of butterfly pictures posted on the white board for visual interest. 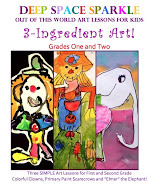 This lesson begins with a sheet of 12" x 18" white construction paper. Instruct the students to fold their paper in half (width wise). 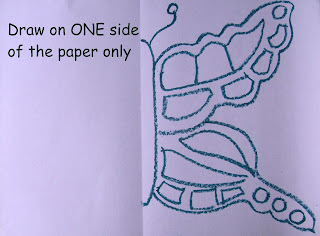 Now, on one side of the paper (using the fold as a guide) flatten out the paper and draw one half of a butterfly. 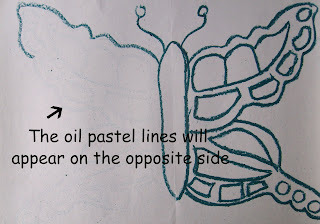 After drawing half the butterfly, fold the paper over and rub the paper. The oil pastel will transfer onto the other half of the paper. It's important to use a dark color oil pastel that is creamy not brittle, otherwise, the pastel will not transfer properly. Also, make sure the kids generate a little heat! This aids in the transferring of the oil pastel. Open up the paper and you will see the lines appear of the other side of the paper. They will be faint. Now, trace over the lines to create a perfect symmetrical butterfly! 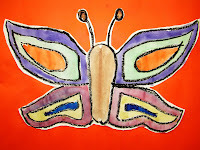 Paint the butterfly with watercolor paints. Cake form is best. Stress how important it is to keep the colors the same on both sides of the butterfly. 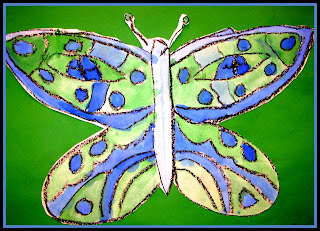 If desired, cut out butterfly and glue onto a colored piece of construction paper.